El Born CCM is a space created for the city to encourage and promote the remembrance of local and national events, as well as those affecting communities around the world. Four areas of activity make this aim possible: carrying out neighbourhood activities to foster information about the events that have left their mark on urban memory and local history; organising events and debates at the headquarters in El Born; providing continuous training; and offering a range of cultural and artistic events that promote national programmes and international projects relating to memory and intangible heritage. El Born CCM is housed in a building that was formerly El Born market, which opened in 1876. The building forms part of other architectural interventions dating from a historical period in which Barcelona was immersed in the European modernist movement. An archaeological site was found in the subsoil, revealing traces of the demarcations of streets and houses Barcelona of the 1700s, serving as a testament both to life in the city and the consequences of the siege of 1714. El Born CCM recognises the significance of the many historical layers that inhabit the site and its memory, and is sensitive to the symbolic importance of the space: a place for supplies, food and exchange, which El Born CCM has converted into a forum for meetings and debates, a space for learning and for enjoying artistic works that reflect on the memory of the facts and events that form human culture. Take a look around its interior or simply stroll through the building. Walk around the centre and see the remains of the neighbourhood demolished by Philip V.
Visit the exhibitions and take part in our activities. El Born CC, a cultural street between the church of Santa Maria del Mar and Ciutadella Park. El Born CC, where you can take a tour of some extraordinary heritage! 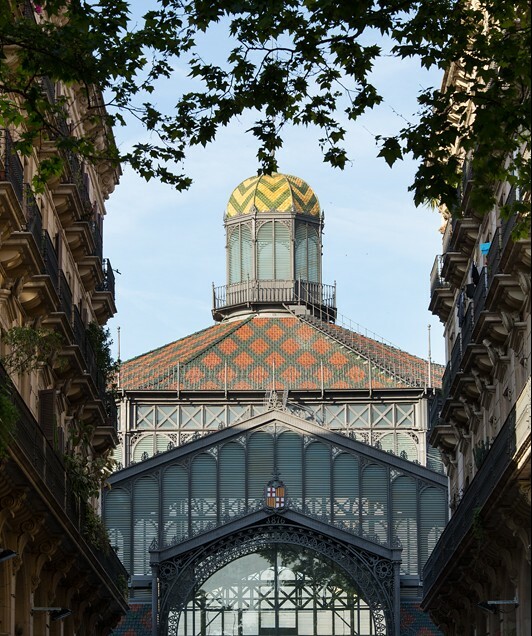 El Born CC is housed inside the old El Born market building, designed by Josep Fontserè in 1876. One of Barcelona’s first examples of cast-iron and glass architecture, it became a symbol of the neighbourhood movements during the 1970s. The El Born archaeological site offers a faithful picture of daily life in the Barcelona of the early 18th century, as you stroll through the streets of the city that resisted the siege by Philip V’s troops in 1713 and 1714, until the final attack and surrender on 11 September. El Born Centre Cultural is a public space with two exhibition halls, two multi-purpose halls, a space for small-scale exhibitions, a food hall and a book and gift shop.